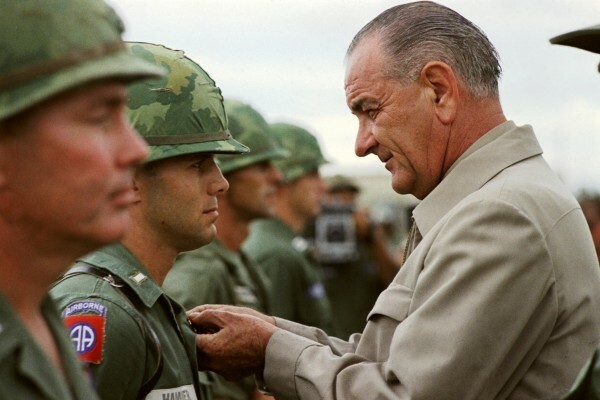 President Lyndon Johnson escalated American involvement in the Vietnam War, something that proved to be his undoing. In 1964, Congress passed the Gulf of Tonkin Resolution, which granted Johnson the power to use military force in Southeast Asia without having to ask for an official declaration of war. The number of American military personnel in Vietnam increased dramatically, from 16,000 advisors in non-combat roles in 1963, to 550,000 in early 1968, many in combat roles. As American casualties soared and the peace process bogged down, Johnson's popularity decreased. Opposition to the war stimulated a large, angry antiwar movement based especially on university campuses. "We have been too often disappointed by the optimism of the American leaders, both in Vietnam and Washington, to have faith any longer in the silver linings they find in the darkest clouds. They may be right, that Hanoi's winter-spring offensive has been forced by the Communist realization that they could not win the longer war of attrition, and that the Communists hope that any success in the offensive will improve their position for eventual negotiations. It would improve their position, and it would also require our realization, that we should have had all along, that any negotiations must be that – negotiations, not the dictation of peace terms. For it seems now more certain than ever that the bloody experience of Vietnam is to end in a stalemate. This summer's almost certain standoff will either end in real give-and-take negotiations or terrible escalation; and for every means we have to escalate, the enemy can match us, and that applies to invasion of the North, the use of nuclear weapons, or the mere commitment of one hundred, or two hundred, or three hundred thousand more American troops to the battle. And with each escalation, the world comes closer to the brink of cosmic disaster. "To say that we are closer to victory today is to believe, in the face of the evidence, the optimists who have been wrong in the past. To suggest we are on the edge of defeat is to yield to unreasonable pessimism. To say that we are mired in stalemate seems the only realistic, yet unsatisfactory, conclusion. On the off chance that military and political analysts are right, in the next few months we must test the enemy's intentions, in case this is indeed his last big gasp before negotiations. But it is increasingly clear to this reporter that the only rational way out then will be to negotiate, not as victors, but as an honorable people who lived up to their pledge to defend democracy, and did the best they could." Following Cronkite's editorial report, President Lyndon Johnson is claimed by some to have said, "If I've lost Cronkite, I've lost Middle America." Some sources say that this is an apocryphal statement because, at the time the editorial aired, Johnson was in Austin, Texas attending Texas Governor John Connally's birthday gala and was giving a speech in his honor. Whether or not Johnson said it, he certainly understood and agreed with the sentiment. CBS News correspondent Bob Schieffer, who was serving as a reporter for the Fort Worth Star-Telegram when Cronkite's editorial aired, acknowledged that Johnson did not see the original broadcast, but claims that Johnson had made the remark. According to Schieffer, Johnson's aide George Christian told him that the President saw some clips of Cronkite's remarks the next day and "that's when he made the remark about Cronkite." In his 1996 memoir A Reporter's Life, Cronkite claimed he was at first unsure about how much of an impact his editorial report had on Johnson's decision to drop his bid for re-election. He said that it was Bill Moyers, fellow journalist and former aide to Johnson, who told him that the President had made the statement. Cronkite quoted Moyers as saying "The president flipped off the set and said 'If I've lost Cronkite, I've lost Middle America.'" Several weeks later, Johnson, convinced his declining health could not withstand growing public criticism, announced he would not seek reelection. During the 1968 Democratic National Convention in Chicago, Cronkite was anchoring the CBS network coverage as violence and protests occurred outside the convention, as well as scuffles inside the convention hall. When Dan Rather was punched to the floor (on camera) by security personnel, Cronkite commented, "I think we've got a bunch of thugs here, Dan." Current Music:Lou Reed-"Christmas in February"